A series of mysterious barges linked to Google cropped up at ports on both the East and West Coast late last year. Following months of speculation that they may be used as data centers, the search giant finally broke silence in November and revealed the company's true intentions: to build floating interactive spaces where people can learn about new technology. The project has sat unfinished ever since and now it appears that Google may ditch the idea completely. According to a report from The Portland Press Herald, Google recently sold the barge to an international barging company. 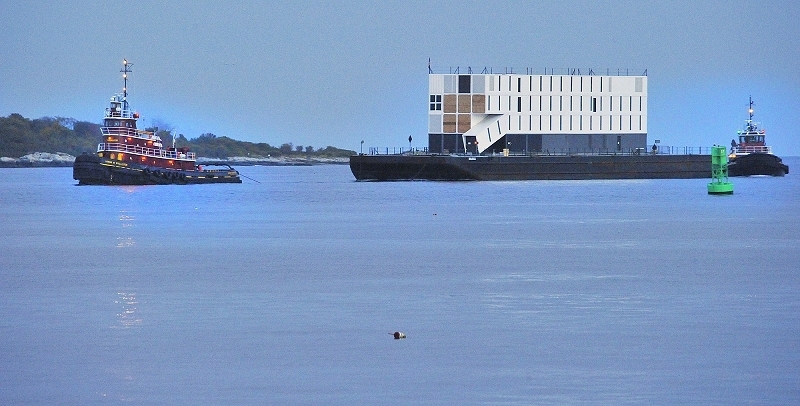 On Wednesday, the barge was towed from Portland, Maine, to a new location where the 63 shipping containers used to create the four-story structure atop the vessel will be dismantled and scrapped before it sets sail on an ocean voyage to an undisclosed location. Portland spokesperson Jessica Grondin said she was bummed when she learned the news. Grondin, along with virtually everyone else in the city, was waiting to see what was actually going to become of the project. The San Francisco barge, meanwhile, was moved to Stockton, California, back in March with its dock fees paid up to October. It remains untouched according to port director Richard Aschieris. Google has yet to comment publically on the matter but given the East Coast barge's fate, I'd be surprised if the West Coast barge doesn't ultimately meet the same fate.